The Phone That Talks When a call comes in, this phone doesn't just let you see who's calling, it actually tells you who's calling with Talking Caller ID1,2. Using text-to-speech technology, the caller's name is announced between rings if name/number Caller ID1 information is available. Can You Repeat That? With SlowTalk message playback, you'll never miss important information again. You can slow down the playback speed of recorded messages by 30 percent at the touch of a button. And with this system's all-digital answering system, those messages will already be crystal clear and easy to retrieve, with up to 18 minutes of recording time. Voices Come Through Loud and Clear By simulating a band signal above and below the normal bandwidth limitations, Voice Enhancer Technology helps clarify and improve sound reception creating a natural-sounding voice that is easy to hear and understand. Turn the Ringer Off... Don't miss important calls when the ringer is off. The Light-Up Indicator at the base of the antenna will flash quickly to show that you have an incoming call, and it will flash slowly to let you know you have a new message. When a call comes in, this phone doesn't just let you see who's calling, it actually tells you who's calling with Talking Caller ID1,2. Using text-to-speech technology, the caller's name is announced between rings if name/number Caller ID1 information is available. With SlowTalk message playback, you'll never miss important information again. You can slow down the playback speed of recorded messages by 30 percent at the touch of a button. And with this system's all-digital answering system, those messages will already be crystal clear and easy to retrieve, with up to 18 minutes of recording time. By simulating a band signal above and below the normal bandwidth limitations, Voice Enhancer Technology helps clarify and improve sound reception creating a natural-sounding voice that is easy to hear and understand. Don't miss important calls when the ringer is off. The Light-Up Indicator at the base of the antenna will flash quickly to show that you have an incoming call, and it will flash slowly to let you know you have a new message. You can also choose up to three different light-up indicator colors to link to your pre-programmed phonebook data. Light-Up ID1,4 requires corresponding Caller ID information to be received from an incoming call. With Ringer ID1, you can choose from a downloaded or selectable ringer to link to your pre-programmed phonebook data, which also requires corresponding Caller ID information to be received from an incoming call. With a Digital Duplex Speakerphone on the back of each handset, you can enjoy convenient, high-quality, hands-free conversations from any room in the house. So let the kids join in on the conversation with Grandma and Grandpa, or paint your nails while you chat with your best friend. 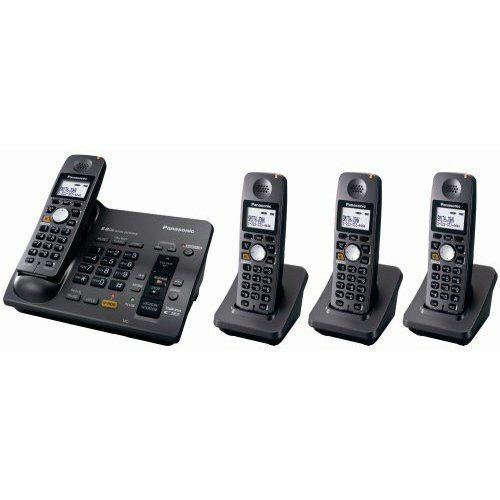 The base unit also features a dual keypad, which lets you dial without having to use the handset. 1. Requires subscription to name-and-number Caller ID, call waiting and/or voice mail services offered by certain local telephone companies for a fee. 2. Name pronunciation may vary. Name pronunciation quality is based on names most commonly used in the United States. 3. Requires optional accessory handset sold separately. 4. Requires name registration in phonebook function. 5. Ni-MH batteries have an advantage over Ni-Cd batteries in that they have high resistance to memory effect and are cadmium-free.